The Fast and Furious duo of Barangay Ginebra has always been incomplete since about three years ago. After pocketing a championship against Arwind Santos and Air21 in the 2008 Fiesta conference, Mark Caguioa has been sidelined for what seemed like forever due to tendonitis. Since then, Ginebra has not won any championship. For about a year now, just when Mark Caguioa began rejuvenating his deadly form again, Jayjay Helterbrand got shelved due to some hamstring injury. Helterbrand was in uniform at the start of the current Governor’s Cup but was not seen playing in the first four games of Ginebra. Many were doubtful if he will get to play after that destructive injury and rookie guards like Robert Labagala and John Wilson making themselves known in the white and red uniform during the runner-up finish of Ginebra in the last conference. Ginebra looked awful since losing the championship against Talk ‘n Text. They lost Rudy Hatfield and had Billy Mamaril and Enrico Villanueva injured, limiting Ginebra’s big men to Yancy de Ocampo and Erik Menk. They lost their import after their fourth game due to an injury. They split their first four games, standing at 2-2 at the first half of the elimination round. 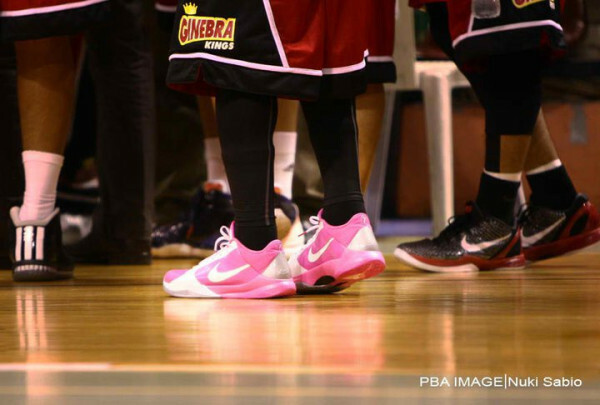 S porting pink Nike shoes and a new hair-do, The Fast was finally seen in limited action last July 8 against Air21. Helterbrand played only for 16 minutes and had five points, five assists, three boards, and a steal to help in Ginebra’s 89-87 win. His numbers does not seem so much and were obviously way off compared to his MVP conference not so long ago. But the more important thing is that Ginebra’s offense looked better with Helterbrand manning the point-guard spot (Curtis Stinson, the import, was injured and did not play). It was organized and had fluidity. Plays were executed properly and points seemed so easy. Helterbrand was back. He was resurrected. Since then, Ginebra won three out of its last four games to finish second with a 5-3 slate in the eliminations. 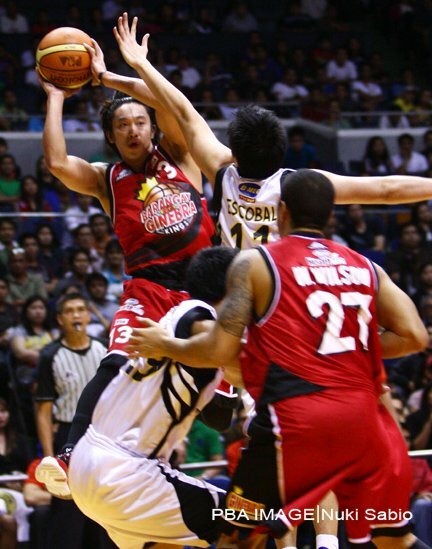 Helterbrand was seen more often and even started against Rain or Shine. To date, Helterbrand is averaging six points, 2.8 rebounds, and four assists. It may still be way off from what we, Ginebra die hards, used to see, but seeing him play again draws our cheers louder, boosts our confidence for another championship, and strengthens our undying faith to Ginebra’s Never-Say-Die motto. With the other half of one of the league’s all-time best backcourt tandems, we continue to believe that the Barangay Big Dome is indeed our home, the home where we witness excitement after every Helterbrand assist and helter-skelter moves, Tubid kalawit rebounds and three point shots, Caguioa ankle breakers and tear-drops, and now Canaleta slam dunks. Barangay Ginebra’s campaign for another crown starts on July 24th as they face B-Meg in the semis. Our hopes are high not only because Helterbrand is back, but also because our team is there slowly getting back into winning form, the form we fans are always proud of. Despite all injuries and departures, our “Gi-ne-bra!” chant would never fade away and would continue to rock Araneta Coliseum one championship after another.